Credit unions and bank accounts are among the safest places to keep your money. But what happens when financial institutions fall on hard times, as they did during the 2007–2008 financial crisis? During that period, numerous banks and credit unions failed as a result of bad investments. Fortunately, most accountholders are protected by deposit insurance. The National Credit Union Share Insurance Fund (NCUSIF) is a government-backed insurance fund for credit union deposits. It functions through the National Credit Union Administration (NCUA). Like FDIC insurance, NCUSIF covers up to $250,000 per account holder per institution. NCUSIF insurance is available in federally insured credit unions. If your credit union goes belly-up, the NCUSIF keeps your money safe. Instead of losing everything, this insurance coverage replaces money that you might otherwise lose from your checking or savings accounts. For example, assume you have $5,000 in savings, and there’s a bank failure or robbery at your credit union. The good news, assuming your funds are insured, is that you still have money. That said, the process of restoring funds may take a few days, although in many cases you'll never notice the event. In some cases, another institution takes over your accounts and loans, but the experience should be relatively painless—certainly in comparison to losing all of your money. When you deposit your money into an account at a regular bank, your funds are covered by the Federal Deposit Insurance Corporation (FDIC), which offers coverage that's very similar to and just as safe as that provided by the NCUSIF. The NCUSIF and FDIC both serve as independent federal agencies that insure customer deposits. 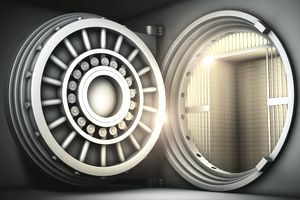 The FDIC protects funds on deposits at banks, while the NCUSIF protects funds on deposit at credit unions. Each entity insures deposits up to $250,000, per person, per registered account, per institution. Both entities cover money in the following types of accounts: checking, savings, money market, CD, and certain other accounts. Neither entity covers the following: stocks, bonds, Treasury securities, mutual funds, annuities, or life insurance. You might buy or invest in different types of products inside the walls of your credit union, but some of those products don’t benefit from NCUSIF protection. For example, stocks, bonds, mutual funds (including money market funds), and the contents of your safe deposit box are not covered by NCUSIF. You can lose money with those products and services, and there’s no government guarantee. Other products might also be excluded. NCUSIF insurance is only available at federally insured credit unions administered by the National Credit Union Administration (NCUA). Other types of credit unions exist, some of which use private insurance, which isn’t necessarily a bad thing, but it’s not as safe as NCUSIF coverage. Look for the NCUA placard at your credit union branch or online. Understanding how much coverage you have can be tricky. To be safe, assume you’re covered up to $250,000 per federally insured credit union. If you have more than that, you can keep the excess in a different credit union. Each of those account titles gets its own $250,000 limit, so you could potentially have $1 million of coverage at one credit union. To verify how much coverage you have, speak with a credit union employee and check out the NCUA’s share insurance estimator, an online calculator for determining your benefits. NCUSIF insurance is “free.” You don’t pay a separate fee for coverage, and you don’t need to sign up. To be more precise, deposit accounts at federally insured credit unions automatically include coverage (other accounts might not be insured, as described above). The credit union pays the cost of deposit insurance. Since you, as an account holder, are a partial owner of the credit union, you indirectly pay the fee. For more on that, find out how banks and credit unions make money. Credit unions contribute to the fund by keeping 1 percent of their deposits in the Share Insurance Fund. The NCUA can also collect additional premiums if the need arises. If for some reason, the fund was to run dry, it's backed by the full faith and credit of the U.S. government. In other words, the U.S. Treasury could provide funds to reimburse account holders against losses. Because taxpayers fund the U.S. Treasury, NCUSIF and FDIC insurance are ultimately backed by the taxing authority of the U.S. government. To date, the NCUSIF has been financed only by credit unions themselves, and it's not been necessary to use any government funds.